Here is an oil painting on plywood I did a few years ago. I have never really liked..so..this past winter I put it outside to protect the bird seed from the snow but as the weather turned warm, i didn’t need to protect the see so i leaned it up against the house…and, was suddenly a late March snowfall yesterday and when i went out to check the birdseed..i saw this…the perfect crop! 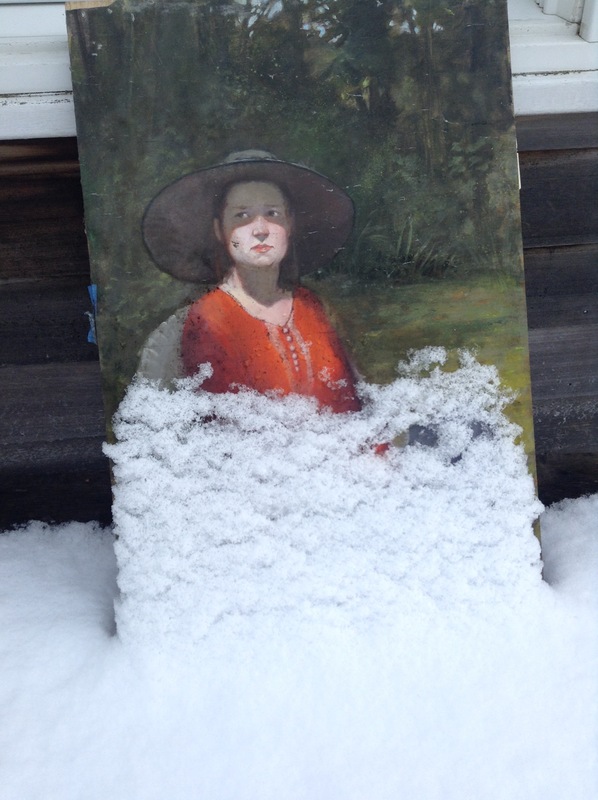 i like the painting much more now that the snow has cropped the bottom! wonder how much damage has been done to the painting…looks pretty good…so..?? Previous Previous post: I like Bernie but here’s a not very flattering caricature I created for a pretend Rolling Stone cover in Anita Kunz smART class last year…i usually don’t show work done in a class but this is entirely my own so i am making an exception…as only i can!! ha!! Next Next post: The snow has melted and the easy crop is gone..